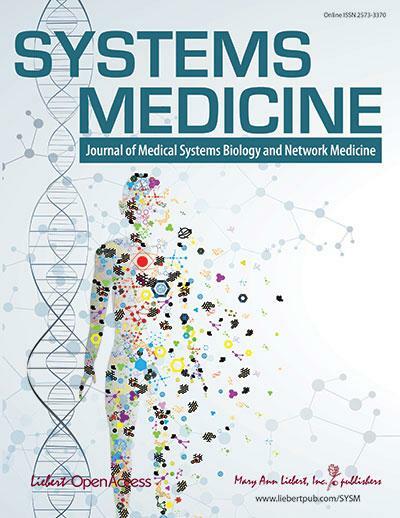 New Rochelle, NY, March 13, 2018–The new peer-reviewed journal, Systems Medicine, has launched with a powerful mission to capture the leading research in the emerging field of medical systems biology. A fascinating Roundtable Discussion with key opinion leaders on the importance of systems medicine and interviews with thought leaders highlight the debut of Systems Medicine, a new open access journal from Mary Ann Liebert, Inc., publishers. The articles are available on the Systems Medicine website. Co-Editors-in-Chief Harald H.H.W. Schmidt, MD, PhD, PharmD, Maastricht University, The Netherlands and Jan Baumbach, PhD, Technical University of Munich, Germany, discuss why the current approach to treating disease fails to drive successful new drug development in their Editorial entitled, "The End of Medicine as We Know It: Introduction to the New Journal, Systems Medicine." Modern omics technology is providing a new way to look at diseases and, combined with advanced molecular tools, a deeper understanding of systems biology, and big data, is enabling new mechanistic definitions of disease. Mary Ann Liebert, Inc., publishers is a privately held, fully integrated media company known for establishing authoritative peer-reviewed journals in many promising areas of science and biomedical research, including Assay and Drug Development Technologies, Big Data, and OMICS: A Journal of Integrative Biology. Its biotechnology trade magazine, GEN (Genetic Engineering & Biotechnology News), was the first in its field and is today the industry's most widely read publication worldwide. A complete list of the firm's 80 journals, books, and newsmagazines is available on the Mary Ann Liebert, Inc., publishers website.